Orson Welles’ career is the stuff of legend – wunderkind Hollywood golden boy with Citizen Kane, then losing most of his subsequent films to studio interference, and eventually finding it impossible to raise enough money to even complete the films he wanted to make. By 1965 when he made Chimes at Midnight, the funding came from Spain and Switzerland, and the film barely got a release in the US. Even before becoming a big shot Hollywood actor/writer/director, Welles was already a noted Shakespearean scholar and actor, and in the late 1940s, his film output shifted to Shakespeare as well, with versions of Macbeth and Othello. He’d long intended to do a Falstaff story, combining the five plays featuring the characters – a stage version called Five Kings hadn’t quite gotten off the ground as early as 1939, then he staged it in 1960, when it was also unsuccessful. 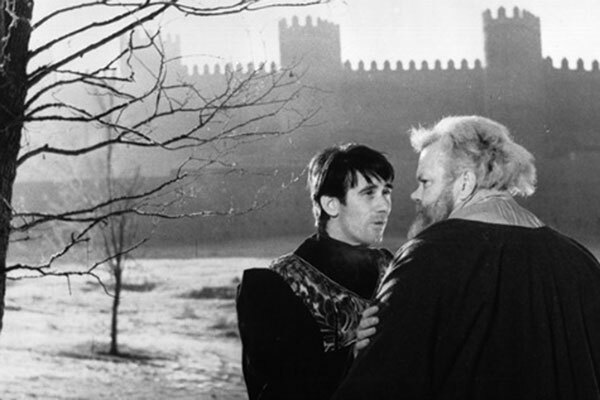 Undaunted, he focused on a film version, which became Chimes at Midnight (sometimes known as just Falstaff). Unlike many of his projects during his later career, Chimes at Midnight was finished, and finished pretty much according to Welles’ wishes. Upon initial release, the film was dismissed by critics, but it has since gained a reputation as one of Welles’ greatest films – Welles himself felt it was his best work. Rights issues have plagued the film, however, and it’s been very difficult to see in any kind of decent quality (it is watchable on YouTube). Rumor has it that the print screened at TCM Fest (courtesy of Filmoteca España) will soon make its way to DVD/Blu-ray, which would be great. As of now, though, the people who saw it at TCM Fest have probably seen the best version of it since its original release. I put the film on my schedule largely because I knew it was a tough film to see; I was in line with people who were huge Welles fans, and I can’t quite claim that for myself. I appreciate Welles’ stuff more than I actually love it, and I’d say that I enjoy more of his acting work (hello, Third Man) than his directing work. I realize that may be blasphemous. Anyway, I am also a Shakespeare fan, but again, the histories (where Falstaff makes most of his appearances) are on the bottom rung of that ladder. Thankfully I had SOME knowledge of the plays, at least Henry IV, Part 1, or I think this would’ve been more difficult to parse. 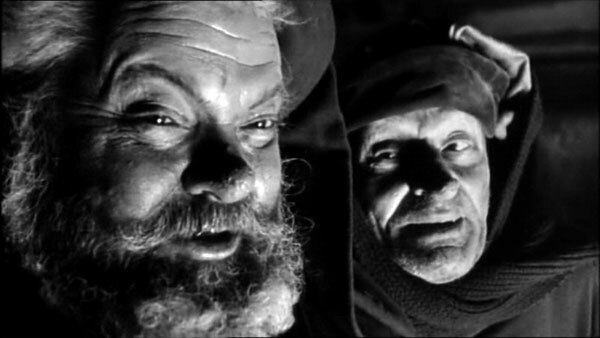 Welles plays the gargantuan Sir John Falstaff, a role that seems made for him in his later, more portly years. He is the constant companion of Prince Hal, son of King Henry IV – while the King tries to secure his throne (which, let’s be frank, he kind of usurped) against rival factions, Hal is out having fun, drinking, chasing women, and generally being useless, an activity Falstaff is more than happy to accommodate. Roughly the first third of the film is this aimless carousing, then there’s a large and quite well-staged extended battle scene as King Henry (finally joined by Hal, as well as Falstaff) quells a rebellion, and in the third act Hal takes the throne as King Henry V, with devastating consequences for Falstaff. 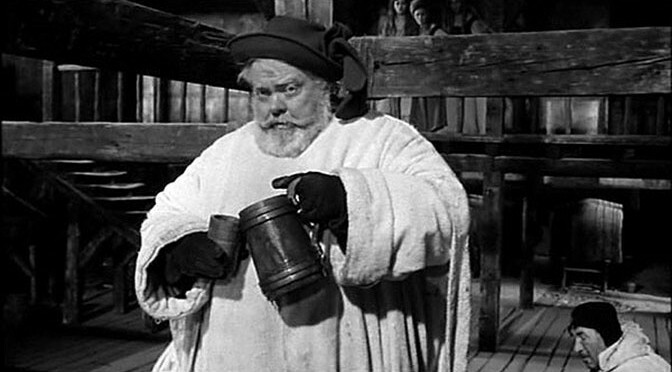 Welles plays Falstaff as something of a mumbling Bacchus, full of wine and merriment, but always with an undercurrent of being too old, too slow, too fat, and too common to be of any real interest to Prince Hal. Hal treats him as a plaything, a diversion, and that’s ultimately how the story plays out. When Hal becomes Henry V, he puts childish things behind him, including Falstaff. But by the end of the story, Falstaff has made us genuinely laugh, and genuinely cry, and his attempt to claim the new king’s favor by virtue of their long and happy association is as heartwrenching as it is pathetic – and it is pathetic. 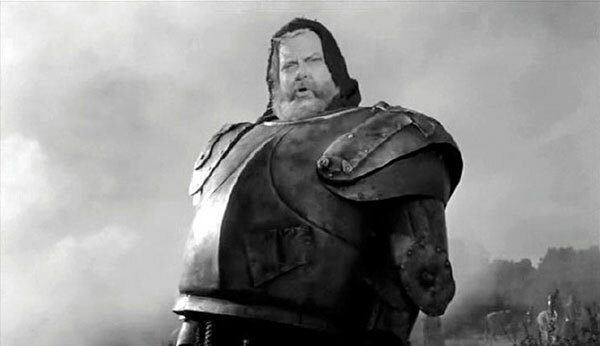 Welles commits not only to Falstaff’s jollity, but also to his innate coarseness, the grossness that Hal found amusing as a carefree youth but disgusting as a king. It’s clear Falstaff has no place at court, and yet a court that has no place for Falstaff seems infinitely cold and cheerless. Stylistically, the film is a bit of an odd duck. It’s interesting that Welles felt it was his finest work, as in some ways it seems far from the classicism of Citizen Kane (of course, everyone’s work will change over twenty-five years, especially with as much creative exasperation as Welles underwent in those years). It’s a bit abrasive, with numerous awkward closeups and claustrophobic setups. Welles has always used close-ups effectively and often jarringly, but here inset close-ups seem outright mismatched with the wider shots around them, and are often timed very unexpectedly. It keeps you on your toes, which is perhaps the point, in a film full of sometimes tedious Shakespearean dialogue? The closest analogue I can think of is the way Roman Polanksi’s early films, especially Cul-de-sac is shot, with harsh and often unattractive close-ups contributing to the uneasy feeling of that film. The battle scenes take on an air of the comic, mostly because pot-bellied stove Falstaff is constantly running the opposite direction of the flow of battle (he never even makes it onto his horse), trying to make himself useful for once but just always in the wrong place. Also, they’re shot as close and confusing as Gladiator, but apparently with the express purpose of making you realize that there’s no good or bad side here, just fools battling over a crown that no one really has any right to anyway. Once in a while you can pick out some of Falstaff’s men (basically peasants carrying farm implements), but for the most part, it’s just chaos with everyone wearing indistinguishable suits of armor. Any moments I found dull (most of Henry IV’s speeches, no disrespect to John Gielgud, who is as impressive as you’d expect) or off-putting (a good bit of the first act, and those incessant close-ups) were totally made up for by the third act, when Hal begins to grow up and take some responsibility. The interplay between the newly mature Hal and the left-behind Falstaff, who swiftly turns into one of the greatest tragi-comic figures in all of literature, is fascinating – you’re both glad that Hal is stepping up to the plate, and heartbroken for the human wreckage he left in his wake. 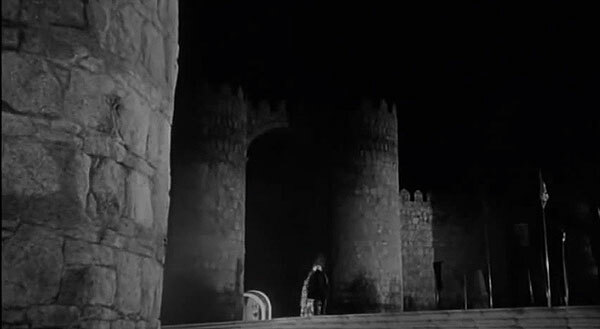 In many ways, I wish the film had ended simply with Falstaff’s long walk out of the court, through a gate in dark and towering castle walls. It is the perfect image for the film – the man who once seemed so much bigger than life dwarfed by a symbol of the power and honor he will never have. Previous PostXKCD – Cinematic US MapNext PostTCM Film Fest 2015: Why Be Good?